Thomas Cook Money, a newly launched financial services division of travel agent Thomas Cook, and Ferratum Group, a digital consumer and SME lender, have teamed up to launch “the first ever mobile banking app designed for holidays”. Dubbed Sumo, the app “is designed to simplify the way that holidaymakers plan and save for their travels and manage their spending when overseas”, according to Thomas Cook. The app is now available in Sweden, and will be rolled out to more markets, including the UK, in the course of 2018. 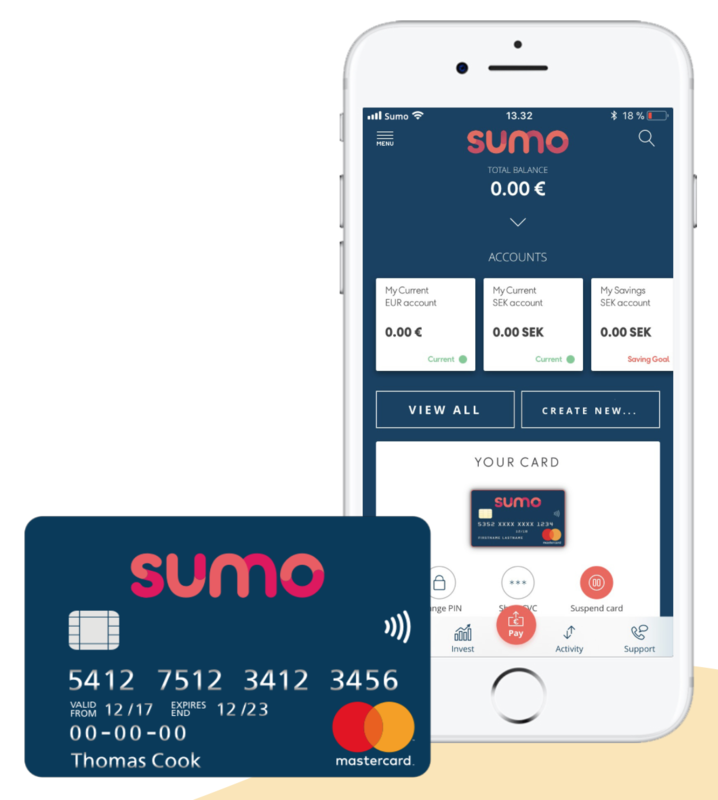 With Sumo, customers can set up a fee-free multi-currency account that comes with an “intelligent” contactless debit card. “This can automatically identify the local currency, thus enabling them to pay at point of sale (POS) at home and overseas without incurring transaction charges and withdraw cash without incurring additional fees,” Thomas Cook explains. The app currently supports seven currencies (including SEK, GBP and EUR) and allows customers to make four fee-free ATM withdrawals at home and abroad per month. In addition, Sumo offers regular and fixed-term savings accounts to “help people take a year-round approach to planning for their holiday, which remains one of the biggest annual household spends”. The app’s in-built savings tool enables users to set up a weekly or monthly savings plan to reach their target goal. Once the goal is reached, users just click through to the Thomas Cook holiday booking engine to book their holiday. Thomas Cook emphasises that Sumo “has been developed with ease at its core”, making it simple and quick to use. Customers can be set up in under ten minutes, it says. As part of the sign-up process, eligible customers in Sweden can apply for an overdraft facility up to a maximum of SEK 20,000 ($2,500) – “to dip into additional funds via the app”. Sumo also allows customers to send money to friends and family via SMS to cover shared holiday expenses. “Ferratum’s international reach is a great fit for our biggest markets,” says Anth Mooney, MD of Thomas Cook Money. Working with Ferratum has given the company “an established, ground breaking platform for mobile banking services”, she adds. Ferratum was set up in 2005 and is headquartered in Helsinki, Finland. It operates in 25 countries across Europe, Africa, the Americas and Asia Pacific, and claims 1.8 million customers. Ferratum Mobile Bank was launched in 2016 and is currently available in five European markets. Ferratum uses Mambu’s core banking solution to support its SME lending services in Finland and Sweden. The system is provided on a hosted basis. The group also uses Finastra’s Fusionbanking core system at its subsidiary bank in Malta.